GallonDaily is generally not disposed to articles that speculate about what may be in Canada’s future but a recent announcement from Siemens was so compelling, and so close to what may be, that we could not resist. Many Canadians will recall trolley buses, those speedy, silent, and local emissions-free buses that ran on a couple of wires strung from poles along the side of the road. Residents and visitors to Vancouver still have the pleasure of riding on trolley buses operated by BC Transit as part of the city’s public transportation network. Now Siemens is developing the trolley truck. Same idea as the trolley bus but with the same kind of pickups as a light rail transit train. Two pickups are necessary because the truck is not able to use the running rail as a power return connection in the way that a metal wheeled train can. 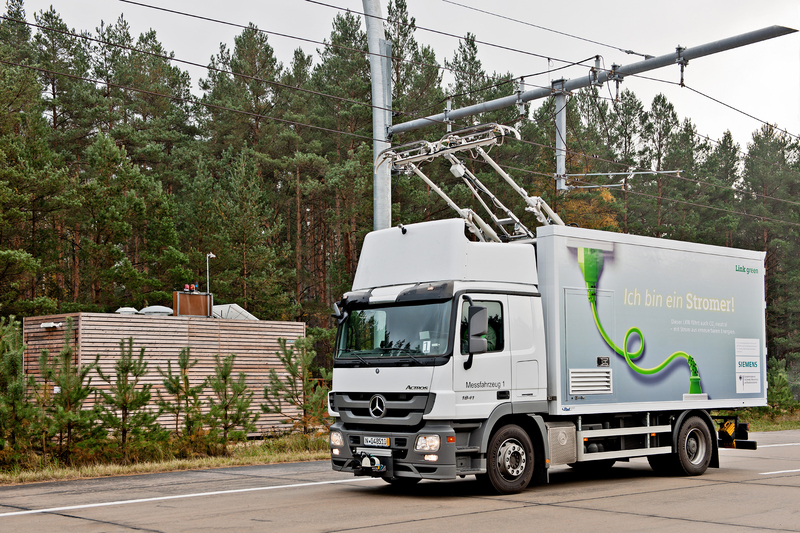 Siemens states that its eHighway trucks are already running in demo mode in Germany and will soon be running in a similar demo in a couple of huge port areas in California. The smart element of the eHighway truck is that, like some modern trolley buses, it can run on electricity where wires are present and on diesel in areas where there is no overhead system.